In the last twenty years there has been significant research implicating peripheral mechanisms in the generation of migraine headaches. Addressing these peripheral mechanisms by altering local anatomy has shown anecdotally, retrospectively, prospectively randomized as well as in placebo controlled trials to greatly reduce or eliminate headaches. There has been a lot of confusion for a variety of reasons about the efficacy of these interventions as they have come from many different fields. This conference is designed to finally promote a conversation among specialties to help better determine a treatment algorithm to reduce migraine disease with the least amount of long term dependence on medications, particularly in light of today’s opiate crisis. Attendees to the lecture should be able to identify current and emerging issues and advances affecting the diagnosis and delivery of treatment for migraine headache management. To educate providers treating headache on new interventional approaches from a variety of fields including Migraine Surgery, Neurology, ENT, Maxofacial Surgery and Pain Specialty. The Maine Medical Education Trust designates this live activity for a maximum of 6.75 AMA PRA Category 1 Credit(s)TM. Physicians should only claim credit commensurate with the extent of their participation in the activity. The Migraine Surgery Foundation, its planners or faculty for this event have no significant or relevant financial relationships to disclose. Residents and Medical Students must register through the Register Here button below. as well as the Pay Now button in order to receive CME credit. Inform treating physicians about the history of migraine surgery in the US. To share the official opinion paper from the American Society of Plastic Surgery. Demonstrate the need for sharing of information and Collaboration among specialties. Egilius L.H. Spierings, M.D., Ph.D. Appreciate advances in migraine prevention. Understand who is a good candidate for headache surgery. Understand the scope of the problem nationally and worldwide. Describe the pathophysiology of rhinogenic pain. Describe the anatomy of interest in rhinogenic pain. Describe the available medical and surgical treatments for rhinogenic pain. Describe the pertinent anatomy of the pain pathways of the face/head and neck. Describe the techniques for peripheral nerve and sphenopalatine ganglion blocks. Describe the indications/protocol for management of facial pain with nerve blocks. Identify role that extracranial arterial pain plays in migraine. Identify the diagnosis of extracranial arterial pain. The surgical treatment of extracranial arterial pain. Name headache trigger / agitators. Understand how headache trigger / agitators contribute to migraine frequency. Understand the work up of non-migraine triggers. This is an opportunity for the general public to ask question and learn more about Migraine Surgery. 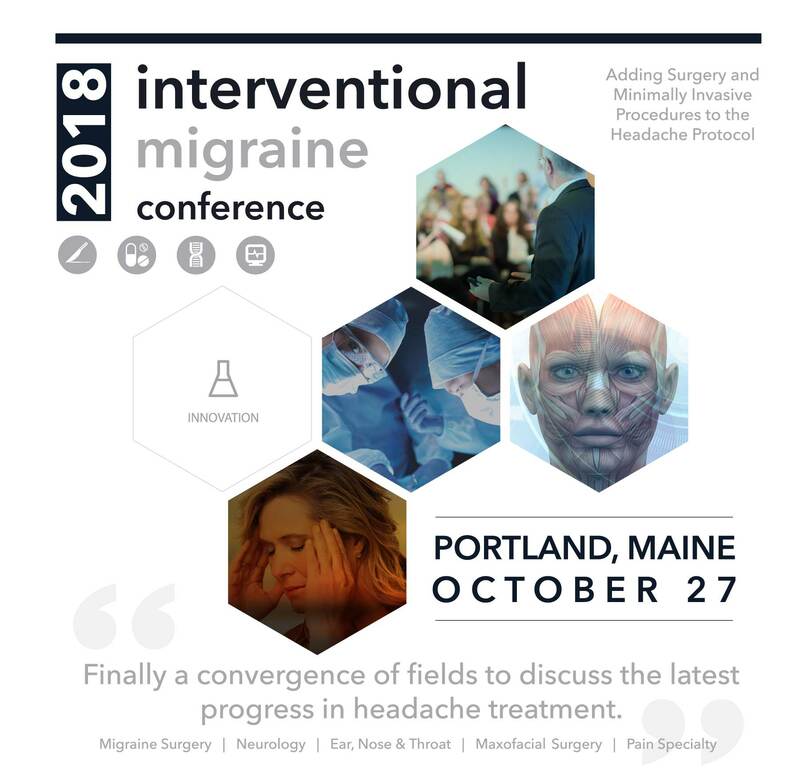 This activity has been planned and implemented in accordance with the accreditation requirements and policies of the Accreditation Council for Continuing Medical Education (ACCME) through the joint providership of the Maine Medical Education Trust and The Migraine Surgery Foundation. The Maine Medical Education Trust is accredited by the Maine Medical Association Committee on Continuing Medical Education and Accreditation to provide continuing medical education for physicians. The Migraine Surgery Foundation is a 501(c)(3) nonprofit tax-exempt public charity. All contributions are tax deductible to the extent allowable by law.